On May 16 at River Valley High School, senior Maddee Tabor signed a letter of intent to join the University of Rio Grande track and field team. Sitting in the front row, from left, are Bret Tabor, Maddee Tabor and Valerie Tabor. Standing in the back row are Chuck Wood, Burt Wood and Richard Stephens. BIDWELL, Ohio — Just a stone’s throw away. River Valley senior Madison Tabor’s step to the next level of competition in the realm of track and field will indeed be a journey — but one that remains close to home. 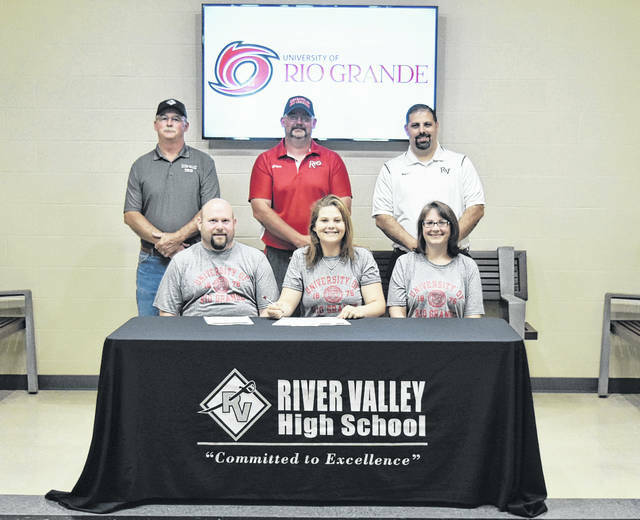 On May 16 at River Valley High School, senior Madison Tabor signed a letter of intent to join the University of Rio Grande track and field team. 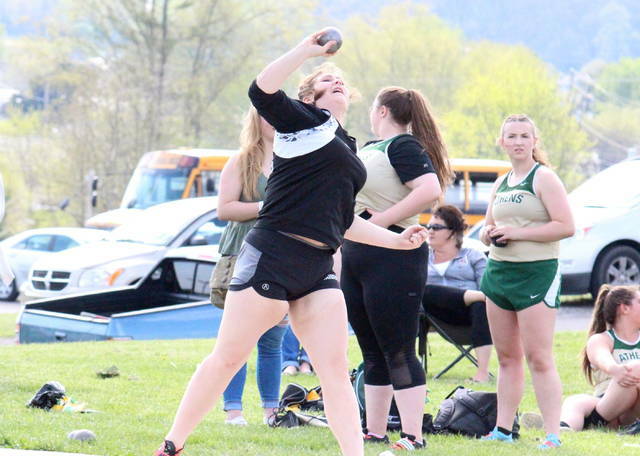 Tabor’s signing came on the heels her most recent triumph on the field, having earned a spot at the Region 7 championships following a third place finish in the shot put at the Division II Southeast District at Meigs High School on May 15. In addition to her success on the track and field squad, Tabor also was a member of the Silver and Black’s volleyball and swimming teams. Tabor elaborated on her decision to continue her track and field career, along with the possibility of returning to the court as a member of the RedStorm volleyball program. Tabor began her high school athletic career at Gallia Academy, but stated her junior and senior years at River Valley also provided her with her fond memories and opportunities to blossom as a person and an athlete. “I was warming up with my friend Kelsey Brown,” said Tabor. “I was doing one of my overhead passes and I slipped and fell and the shot actually landed two feet from me. I didn’t know but everyone else was cracking up. That was a fun time. It’s what everyone knows me for — just being goofy and carefree. Tabor’s track and field coach was Brent Smith, who noted her leadership as an important addition to his program over the last two years at River Valley. For Tabor, distance is not only a key element to her chosen event on the track and field, but an important factor to her decision to further her education just eight miles from where she attended high school. Tabor will throw under the tutelage of another Gallia County native, Rio track and field assistant coach Burt Wood. Wood — who has served as a coach with the program for eight seasons — was candid in his response to the addition of Tabor to the team. Tabor is deciding between two majors psychology or political science then pursuing further education in law school. In addition to her athletic endeavors at RVHS, Tabor was a member of Fellowship of Christian Athletes, Beta Club, student council, STAND, and the suicide prevention committee. Tabor currently holds a 3.6 grade-point average on a four-point scale and is the daughter of Bret and Valerie Tabor.